CFC or other CERT training alumnus who are or were registered with Harris County Citizens Corp (HCCC), and are unable to log your volunteer hours into the HCCC Activities Journal (due to a changed email address or other log-in problem) should submit a summary of the problem to Julie Oates, (Julie.Oates@oem.hctx.net) and Lionel Bryant (Lionel.Bryant@oem.hctx.net). Julie and Lionel will try to assist in solving your log-in problems. 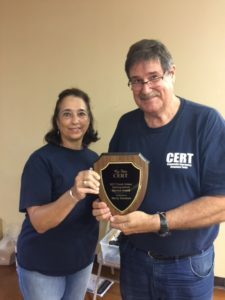 The Cy-Fair CERT 2017 Frank Votaw Distinguished Service Award was presented to Marty Samson at the June 13th General Meeting. Marty was a member of the first CERT class and has served in the past as an officer and been a long time Board member. He has been responsible for maintaining the emergency response supplies at the area S.A.F.E. locations and the S.A.F.E. mobile trailer. He has chaired numerous events over the years including Shop til You Drop, the CFVFD Christmas Parade, BPMS150, and CERT Rodeo to name a few. He is active with the CFCARC participating in Field Day and other events. In addition, Marty also has made presentations about the CERT program to numerous civic organizations. Congratulations Marty! As of May 10, 2016, Cy-Fair CERT’s Rapid Response Team (RRT) has been officially activated. The RRT is a response team with specialized training available to meet the needs and requests by the community and agency outreach. We have been using this response team for several months to respond to heavy rains and flooding in our area and working with the Cy-Fair Volunteer Fire Department, the Red Cross and the Harris County Office of Homeland Security and Emergency Management. We have 18 people that already meet the additional training requirements for the RRT and expect to continue to grow and expand to meet more of the needs of our community. This team has long been a goal of Cy-Fair CERT’s so that we can use not only our CERT training, but our additional skills and knowledge, in a meaningful and useful way. Congratulations to all of our RRT! Your hard work is much appreciated! If you would like more information about Cy-Fair CERT’s RRT, please contact us at socialmedia@cyfaircert.org. Remember Amazon Smile at www.smile.amazon.com to make your purchases and support Cy-Fair CERT! Click here to set Cy Fair CERT as your charity for Amazon Smile!